← The Strawberry Donuts are Coming! The Strawberry Donuts are Coming! 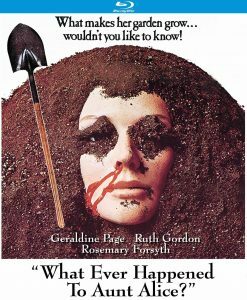 “What Ever Happened to Aunt Alice?” (1969, Kino Lorber) Having found an expedient solution to her financial woes by bilking and then murdering a succession of housekeepers, widow Geraldine Page appears to meet her match in new hire Ruth Gordon. Though labeled as “hagsploitation” due to its mature leads and producer Robert Aldrich, who oversaw the subgenre’s Ur-text (“What Ever Happened to Baby Jane?”), “Alice” plays more as a macabre whodunit than Gothic horror, largely due to an emphasis on suspense over ghoulish histrionics in Lee H. Katzin‘s direction and Theodore Apstein‘s script. Those that prefer their “psycho-biddy” titles on the unbridled side may find “Alice” tame; others may appreciate Page and Gordon’s ripe and savvy turns, respectively, as older women with very different notions of survival. 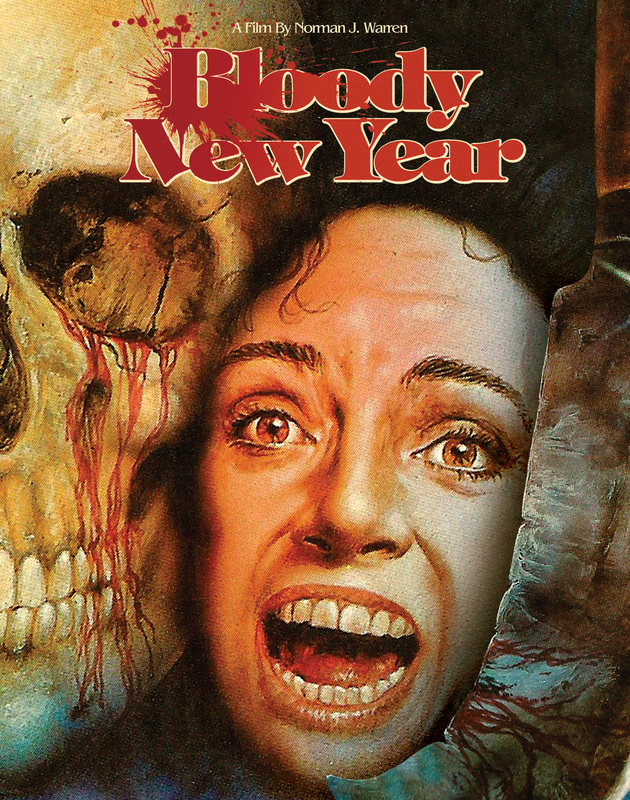 Kino’s Special Edition Blu-ray offers a 4K restoration and commentary by Richard Harland Smith, who weighs in on the source novel by Ursula Curtiss and Aldrich’s troubled production company, among other topics. 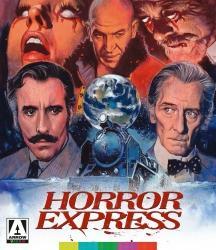 “Horror Express” (1971, Arrow Video) Turn-of-the-century British scientists Christopher Lee and Peter Cushing spar (genteelly, of course) over the former’s discovery of a prehistoric humanoid, unaware that the creature – which Lee is transporting by train from China to Moscow – harbors an alien presence with the ability to possess others. Despite its out-to-lunch premise, this blend of science fiction, pulp adventure and horror from Spanish director Eugenio Martin is terrific good fun; the pace is brisk, the period detail, score by John Cacavas and photography by Alejandro Ulloa all top-notch, and the monster, which has the unpleasant habit of turning its victims’ eyes white and brains smooth, is alarming, cunning and unpredictable. The two stars appear to be enjoying a chance to spoof their screen presences and engage in some vigorous brawling, for which they’re joined by Telly Savalas as an anarchic Cossack officer. Arrow’s Blu-ray ports over extras from the 2011 Severin release, including interviews with Martin, Cacavas and producer Bernard Gordon, and adds expert new commentary by Kim Newman and Stephen Jones. “Nightwing/Shadow of the Hawk” (1979/1976, Mill Creek Entertainment) Two ’70s-era supernatural thrillers, both with storylines anchored in Native American mythology: the Canadian-lensed “Hawk” stars Jan-Michael Vincent as a businessman who reunites with his shaman grandfather (Chief Dan George) to fight the spirit of a vengeful witch, while “Nightwing” pits reservation cop Nick Mancuso against tribal councilman Stephen Macht, who wants to pillage sacred grounds for oil reserves, and a swarm of plague-carrying vampire bats. Pulpy scripting and tepid direction (by Arthur Hiller and George McCowan, respectively) upend the fright potential for both films, though the presence of George in “Hawk” and David Warner as a dogged bat expert and creature design by Carlo Rambaldi in “Nightwing” hold the attention. Mill Creek’s Blu-ray is widescreen. “Bloody Birthday” (1981, Arrow Video) A trio of infants born during a solar eclipse grow into pint-sized psychopaths that decimate the adult population of their small town in a variety of creative ways. Low-budget and lesser-known title in both the slasher and killer kid subgenres is junk food horror, without question, but has a gleefully morbid streak and the presence of Jose Ferrer (doctor), Susan Strasberg (ill-fated teacher) and Julie Brown (“Homecoming Queen,” not Downtown) to recommend it; Arrow’s Blu-ray includes two commentaries, one by its dependably eclectic/eccentric writer-director, Ed Hunt, and the other by podcast crew The Hysteria Continues, as well as well as interviews with co-star Lori Lethin, producer Ken Gord and uncredited producer Max Rosenberg of Amicus anthology fame. “The House That Would Not Die” (1970, Kino Lorber) Barbara Stanwyck and niece Kitty Winn (“The Exorcist”) discover that their Revolutionary War-era house comes with a hidden feature – the unquiet ghosts of its previous occupants – and with the help of neighboring professor Richard Egan and his student (Michael Anderson, Jr.), set out to find out the root cause of the supernatural phenomena. 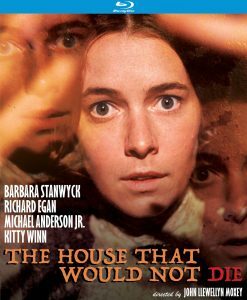 Aaron Spelling production for ABC’s Movie of the Week benefits greatly from the talent in front of the camera and veteran director John Llewellyn Moxey (“The Night Stalker,” 1971); they lend polish and suspense to a modestly effective Gothic piece best appreciated by devotees of ’70s small screen terror. Kino’s Special Edition Blu-ray includes an interview with Moxey and detailed commentary by Richard Harland Smith, which touches on a vast array of subjects, from the Alphabet Network’s early TV-movie output and Stanwyck’s TV career to the script by Henry Farrell (who wrote the source novel for “What Ever Happened to Baby Jane?”). 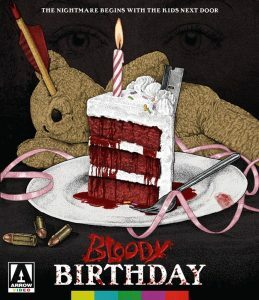 And though it’s well after Christmas, a body count picture about a rampaging psychopath carving a path through unpleasant partying teenagers while dressed as Santa Claus – as is the case in “Christmas Blood” (2017, Artsploitaiton) – should always be in season for the grindhouse lover in you (or the one you love). Especially is said slasher is from Norway, where the naturally dark and snowy landscape lends some atmosphere. This entry was posted in Movies, Television. Bookmark the permalink.